Brett cast in reading at the Kraine! One night only! Tuesday, APRIL 16 at 6pm! 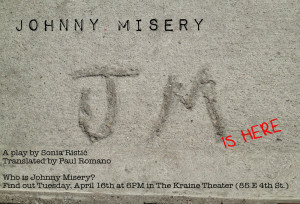 Brett will be playing the role of Mary-Wary (the meanest, greediest, most vile creature to ever walk the Earth) in Sonia Ristic’s JOHNNY MISERY, a quirky comedy. TICKETS ARE 100% FREE and you can get them at the door. The Kraine is at 85 E. 4th St!